In this tutorial I’ll show how to build a custom Eclipse distribution with Maven/Tycho. We will create an Eclipse distribution including our own features/plugins and standard Eclipse features, trying to keep the size of the final distribution small. 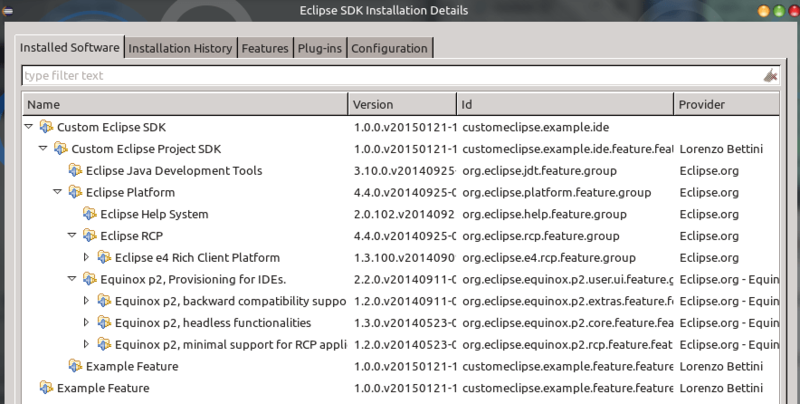 You see that “Eclipse SDK” is the product (org.eclipse.sdk.ide), and “Eclipse Project SDK” is the feature (org.eclipse.sdk.feature.group). Our custom feature can be installed in an existing Eclipse installation, thus we can release it independently from our custom Eclipse distribution. 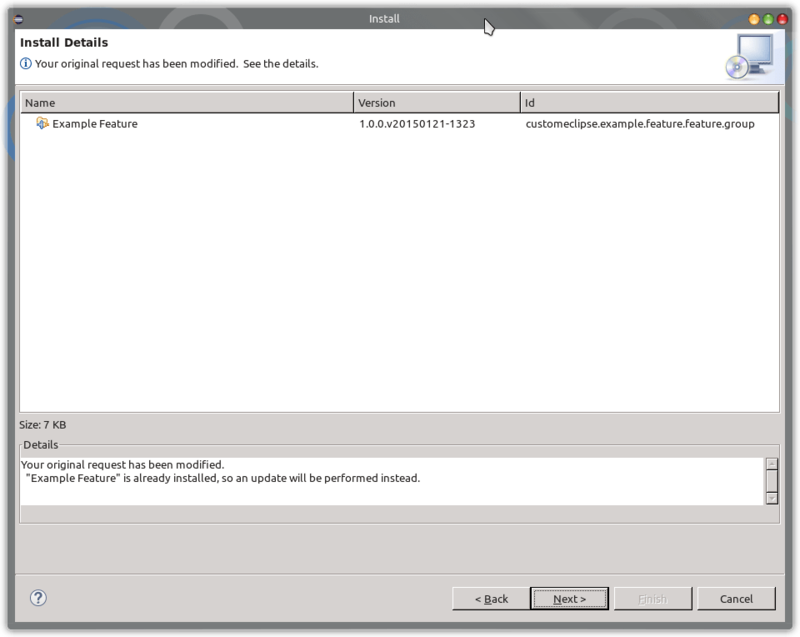 Our custom Eclipse distribution must be updatable, e.g., when we release a new version of our custom feature. All these projects are then configured with Maven/Tycho pom.xml files. This feature will then specify the features that will be part of our custom Eclipse distribution, i.e., our own feature (customeclipse.example.feature) and all the features taken from the Eclipse update sites that we want to include in our custom distribution. NOTE: I’m using two different p2 repository projects because I want to be able to release my feature without releasing the product (see the scenario at the beginning of the post). This will also allow us to experiment with different ways of specifying the features for our custom Eclipse distribution. Note that we use org.eclipse.sdk.ide and org.eclipse.ui.ide.workbench for launching product extension identifier and application (we don’t have a custom application ourselves). 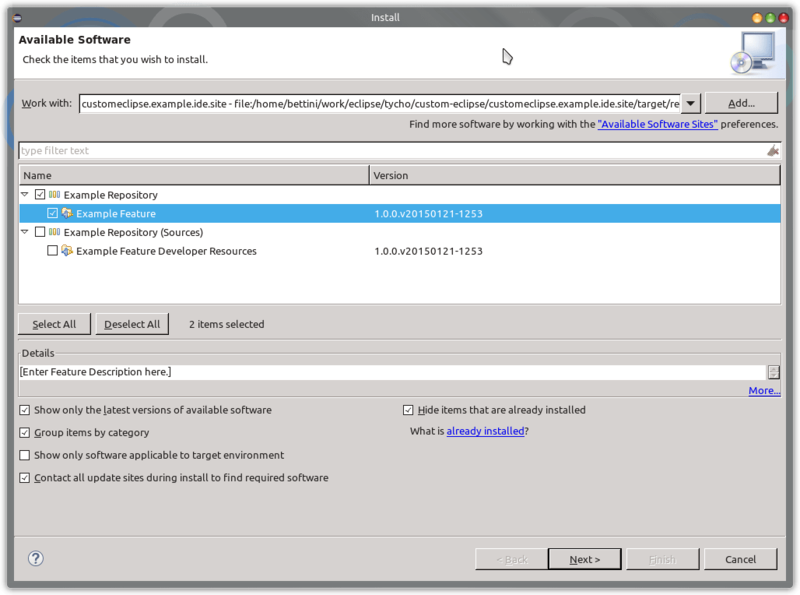 This product configuration includes our customeclipse.example.ide.feature; we also inserted in the end the standard start level configuration, and other properties, like the standard workspace location. In this profile, we also specify the environments for which we’ll build our custom Eclipse distribution. When this profile is not active, the target-platform-configuration will use only the current environment. 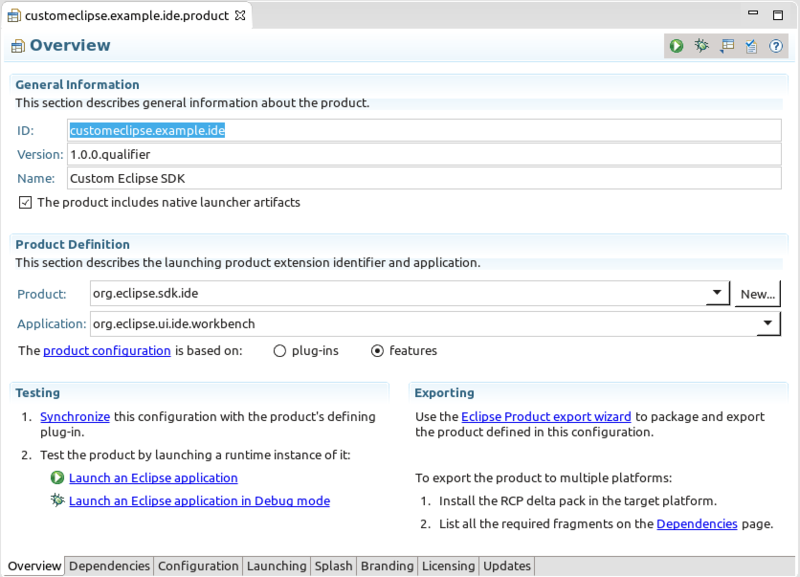 In the rest of the tutorial we’ll examine different ways of defining customeclipse.example.ide.feature. In my opinion, only the last one is the right one; but that depends on what you want to achieve. However, we’ll see the result and drawbacks of all the solutions. You may want to try the options we detail in the following by cloning the example from https://github.com/LorenzoBettini/customeclipse-example and by modifying the corresponding files. To get the materialized products (and the corresponding zipped versions). Now let’s run the build again with above maven command. we will use the p2 repository to try and update the custom ide that we created in the first maven build (the one we copied to a different directory and that we ran in the previous step). 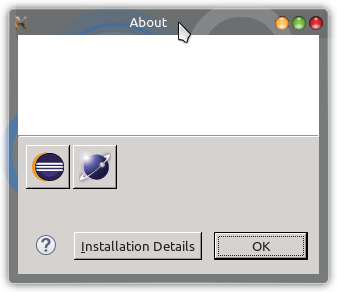 So let’s add this built repository (in my case is /home/bettini/work/eclipse/tycho/custom-eclipse/customeclipse.example.ide.site/target/repository/) in the custom ide’s “Install New Software” dialog. You see our Example Feature, and if you uncheck Group items by category you also see the Custom Eclipse Project SDK feature (corresponding to customeclipse.example.ide.feature) and Custom Eclipse SDK (corresponding to our product definition uid customeclipse.example.ide). Why can’t I update my “Example Feature” by itself? …you get an idea of the problem beneath: since we INCLUDED our “customeclipse.example.feature” in our product’s feature “customeclipse.example.ide.feature” the installed product will have a strict version requirement on “customeclipse.example.feature”: it will want exactly the version the original product was built with; long story short: you can’t update that feature, you can only update the whole product. Before going on, also note in the target directory you have a zip of the p2 repository that has been created: customeclipse.example.ide.site-1.0.0-SNAPSHOT.zip it’s about 200 MB! That’s because the created p2 repository contains ALL the features and bundles INCLUDED in your product (which in our case, it basically means, all features INCLUDED in “customeclipse.example.ide.feature”). 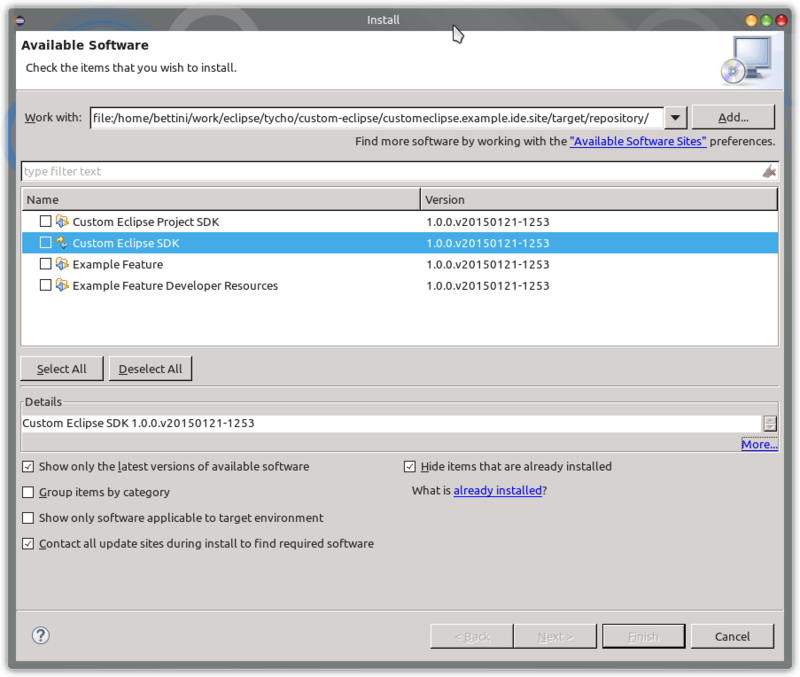 Let’s try and modify “customeclipse.example.ide.feature” so that it does NOT include the features, but DEPENDS on them (we can also set a version range for required features). 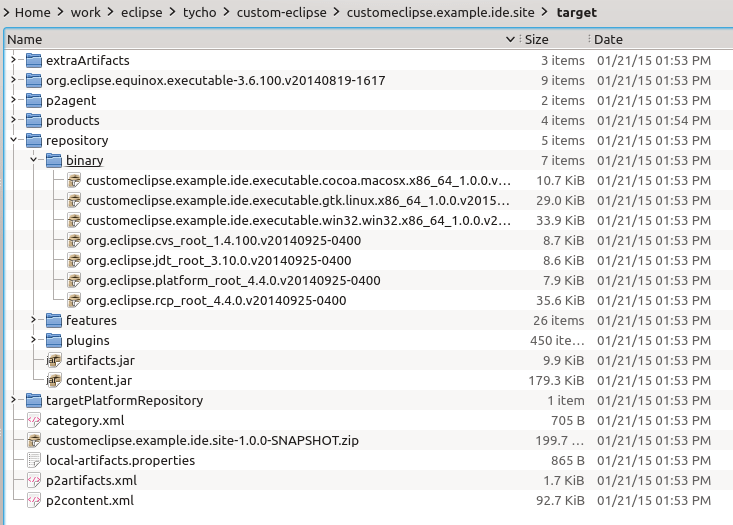 First of all, note that the p2 repository zip in the target folder of customeclipse.example.ide.site is quite small! Indeed, the repository contains ONLY our features, not all the requirements (in case, you can also force Tycho to include all the requirements), since, as stated above, the required feature will not be part of the repository. So we can manually update it, but not automatically (“Check for updates” will still propose to update the whole product). To make a feature updatable in our product we must make it a “Root level feature” (see also http://codeandme.blogspot.com/2014/06/tycho-11-install-root-level-features.html). [INFO] --- tycho-p2-director-plugin:0.22.0:materialize-products (materialize-products) @ customeclipse.example.ide.site --- [INFO] Installing product customeclipse.example.ide for environment ... 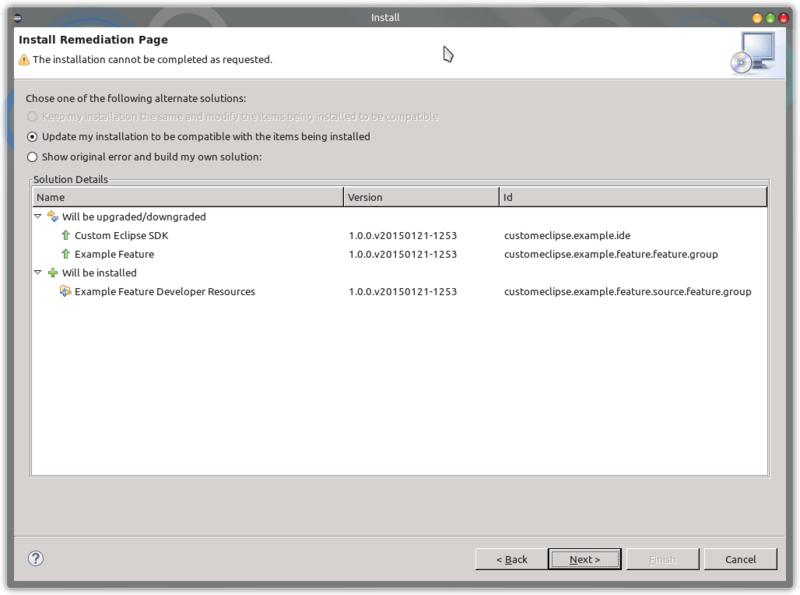 Installing customeclipse.example.ide 1.0.0.v20150121-1346. 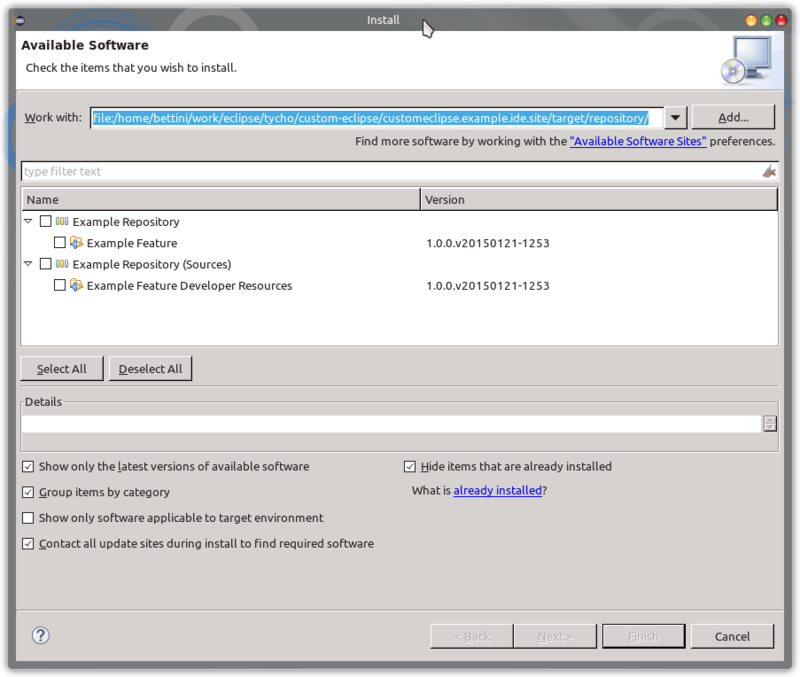 Installing customeclipse.example.feature.feature.group 1.0.0.v20150121-1346. Let’s do the experiment again; but before trying to update let’s see that the installed software layout is now different: our Example Feature is now a root level feature (it’s also part of our Custom SDK IDE since it’s still required by customeclipse.example.ide.feature but that does not harm, and you may also want to remove that as a requirement in customeclipse.example.ide.feature). and also Check for updates proposes “Example Feature” as updatable independently from our product! What happens if we make also customeclipse.example.ide.feature” a root feature? You may want to try that, and the layout of the installed software will list 3 root elements: our product “Custom Eclipse SDK”, our ide.feature “Custom Eclipse Project SDK” (which is meant to require all the software from other providers, like in this example, the org.eclipse.sdk feature itself) and our “Example Feature”. This means that also “Custom Eclipse Project SDK” can be updated independently; this might be useful if we plan to release a new version of the ide.feature including (well, depending on) other software not included in Eclipse SDK itself (e.g., Mylyn, Xtext, or something else). At the moment, I wouldn’t see this as a priority so I haven’t set customeclipse.example.ide.feature as a root level feature in the product configuration. The problem of basing our distribution on org.eclipse.sdk is that the final product will include many features and bundles that you might not want in your custom distribution; e.g., CVS features, not to mention all the sources of the platform and PDE and lots of documentation. Of course, if that’s what we want, then OK. But if we want only the Java Development Tools in our custom distribution (besides our features of course)? The size of the zipped products dropped down to about 90Mb, instead of about 200Mb as they were before when we were using the whole org.eclipse.sdk feature. To recover the typical branding of Eclipse SDK, we have to know that such branding is implemented in the bundle org.eclipse.sdk (the bundle, NOT the homonymous feature). This entry was posted in Tutorials and tagged eclipse, p2, tycho on March 14, 2015 by Lorenzo Bettini. Thanks Lorenzo, great tutorial! Haven’t tried it but immediately remembered how much pain I had to build my custom Eclipse IDE two years ago (CBI build was at the very beginning). I have a few questions to regarding your example. * What does the “attach-artifact” actually do, because I can’t detect any difference in my result. I also try to understand how the required mechanism works in detail. If I require a component that has been defined in my target platform, where does that URL ref for the P2 repo get stored in the target P2 repo? I have searched, but did not find anything in my target repo that would identify the P2 update site of the required component (nebula in my case). concerning required features, if I understand your question correctly: no URL will be stored in your p2 update site I’m afraid; you have to tell your users about the URLs of required software… that’s something that has always bugged many users… The workflow would be that your users should first add the URL of the required software in the “Install New Software” location (and press ENTER) so that Eclipse will record that update site, and then they can install your software from your p2 update site (they should select the check box “Contact all update sites…”). In Mars, they added the possibility to specify references to required software URLs in your category.xml (have a look at the news of Mars milestones). That way, the URLs will be stored in your p2 update site. Unfortunately, Tycho still does not handle this feature; it works only if you export your features directly from Eclipse. Moreover, I think that this works only if you install software in a Mars Eclipse (but I’m not sure). If you need your p2 update site to be selfcontained, you can instruct Tycho to include all dependencies; that’s also the subject of the next blog post. I am new in eclipse rcp development and came here with the hope to gain some knowledge on the concepts. I just want to let you know that this is a great tutorial for some one with significant development experience in eclipse and eclipse-rcp development , though does not help much anybody trying to begin on the domain. Everything is a bit ambiguous your steps are not define you even start from the middle of the story to begin with ! Anyway it’s a waste of time for somebody that has not experience on the domain because he can hardly make any sense out of it. Do you have an idea of why it is the case ? And any idea on how we could enable developers to use either PDE build or Tycho while having plugins correctly exported and features marked as updatable ? (keeping PDE build around is for the moment necessary for quick testing of functionalities in the release — and because it is more convenient for first-time developers to just have to click on a button rather than going through the process of Maven/Tycho builds). I have no experience at all with PDE build, so I really don’t know how to handle that with PDE build. 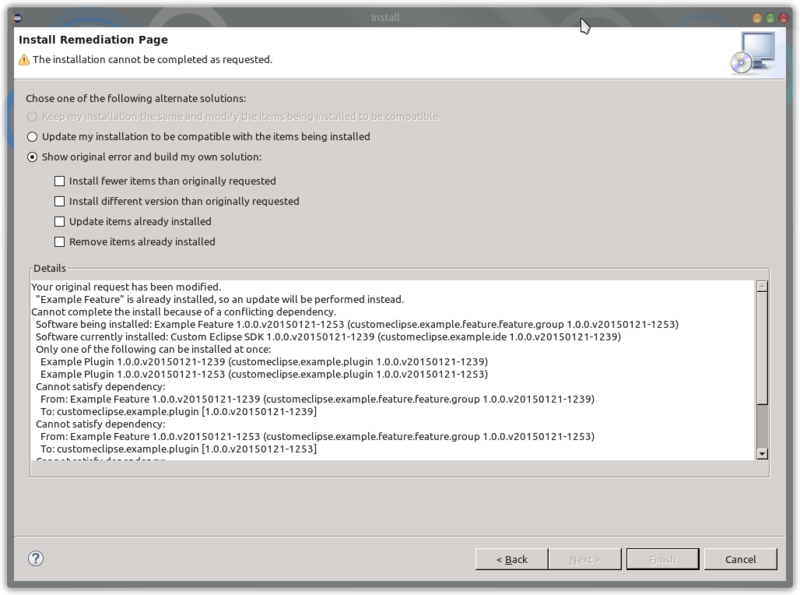 Probably, with PDE build, you need to install the “root” features in the product as dependencies. I guess that could be done with p2.inf. But I’m really not sure about that, I’m afraid.